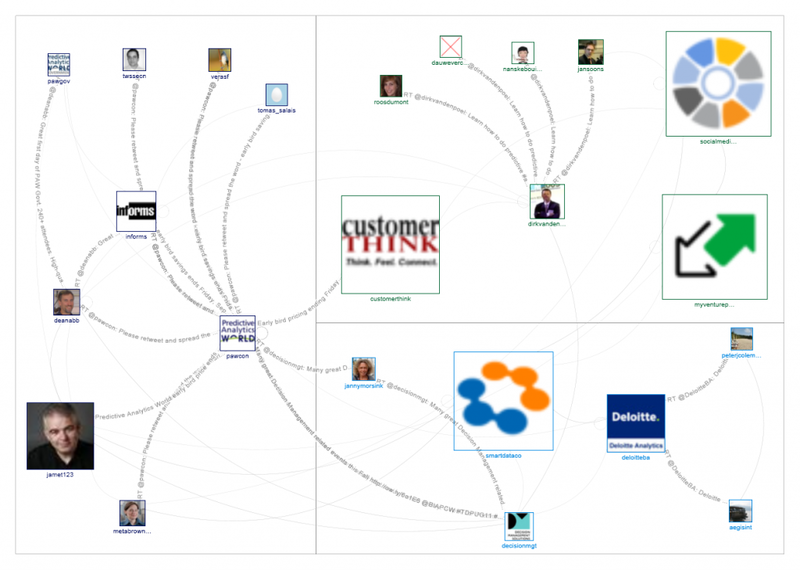 There will be a NodeXL social media network analysis training session at the Consumer Goods Sales and Marketing Summit in New York City on June 1, 2015. 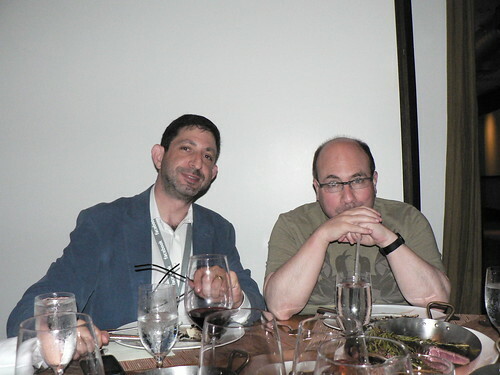 I presented on social media network analysis on October 20, 2011 in New York City at Predictive Analytics World. A map of the connections among the people tweeting about the #Pawcon hashtag is below. Abstract: Networks are everywhere except the end user desktop. NodeXL, the free and open network overview, discovery and exploration add-in for the popular and familiar Excel (2007/2010) spreadsheet allows users who are comfortable making pie charts to now make useful network visualizations. 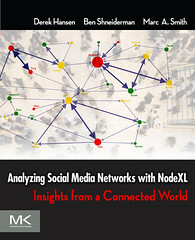 Developed and released by the Social Media Research Foundation, NodeXL uses Excel as a framework, providing a GUI network browser (a “web browser”?) 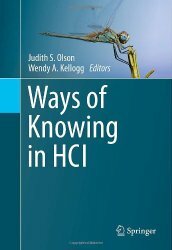 that novices can use quickly and experts can use to generate sophisticated results. Data importers provide access to a range of social media network data sources like Twitter, flickr, YouTube, Facebook, email, the WWW, and more through standard file formats (CSV, GraphML, Matrix). Simple to use tools can automatically analyze, visualize and highlight insights in complex network graphs. 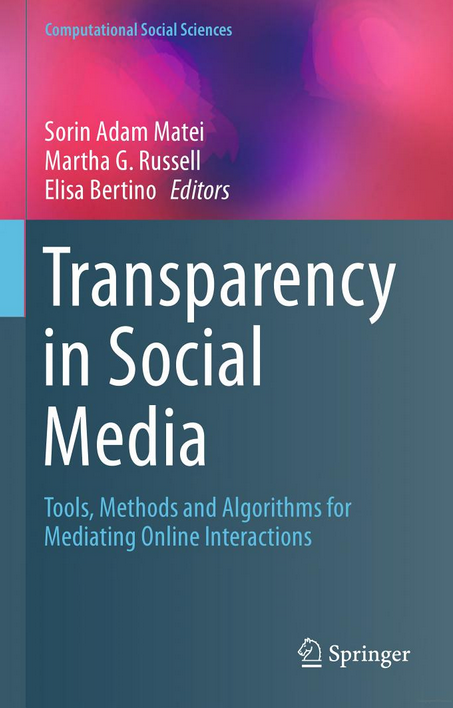 Using NodeXL, researchers have been collecting a wide range of network data sets from various social media services. These images reveal a range of common social formations in social media and point to people who occupy strategic locations in these graphs. These are the connections among the Twitter users who recently tweeted the word #pawcon when queried on October 19, 2011, scaled by numbers of followers (with outliers thresholded). Connections created when users reply, mention or follow one another. Here is an example map of the connections among the people who tweeted the term “pawcon” in Twitter on September 14th, a week prior to the event. Manu Sharma, Principle Research Scientist at LinkedIn gave a great presentation on the patterns found in their data. Big data, for example, showed that most of the people who previously worked at recently failed banks and financial institutions have updated their profiles to show that they mostly have new jobs at some of the remaining companies in the industry. The Workshop on Information in Networks 2011 was held at NYU September 30-October 1st. Over the course of the event a number of people tweeted using the hashtag #win2011. These are the connections among the Twitter users who recently tweeted the word win2011 when queried on October 3, 2011, scaled by numbers of followers (with outliers thresholded). Connections created when users reply, mention or follow one another. 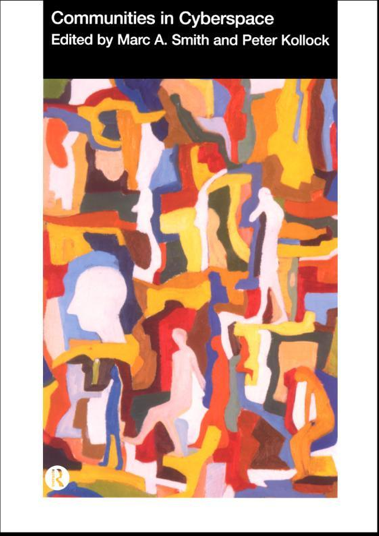 Layout using the “Group Layout” composed of tiled bounded regions. Clusters calculated by the Clauset-Newman-Moore algorithm are also encoded by color. These are the connections among the Twitter users who tweeted the word win2011 when queried a few days earlier on September 30, 2011, scaled by numbers of followers (with outliers thresholded). Connections created when users reply, mention or follow one another. On June 22nd in New York City Wired Magazine and the Economist hosted a day of discussions and displays related to the theme of “Nextwork” hosted by Juniper Networks and located at the Tribeca Rooftop. The Social Media Research Foundation displayed and printed Nextwork Networks maps of the connections among the people who tweeted about the conference, the speakers, and their companies. Visit the NextWork Network booth hosted by the Social Media Research Foundation to see a map of the connections among people who tweeted the term “NextWork“. 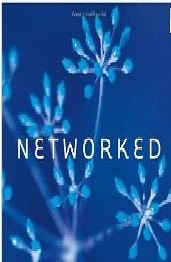 Networks are important data structures but the tools to access, analyze and visualize networks have been hard to use. New tools now make networks as easy to handle as making a pie chart. 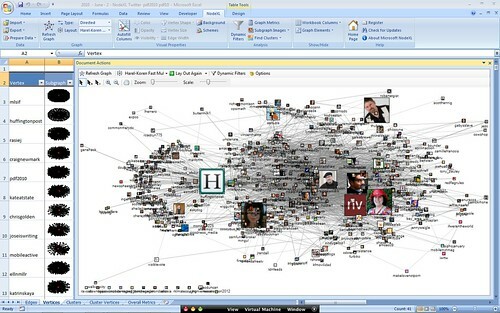 NodeXL, the free and open network overview, discovery and exploration add-in for the familiar Excel spreadsheet, makes creating network diagrams and gaining insights much simpler (see: http://nodexl.codeplex.com). 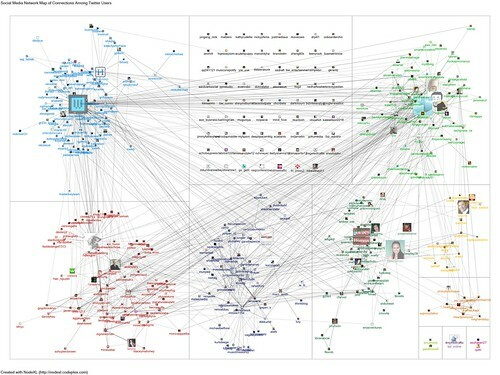 Using NodeXL, we have been collecting all the tweets that mention the NextWork event and building a network map of the ways those people connect to one another. Not everyone is equally connected: some people occupy more strategic locations in the web of connections than others. Find out who: request your own NodeXL social media network map for your Twitter account or the name of your company or brand (or your competitors) by dropping by the booth (or visit: http://www.smrfoundation.org/nextwork2011). Ben Shneiderman and Jenny Preece will speak about their work on social media applied to national priorities with a talk titled: “Promoting National Initiatives for Technology-Mediated Social Participation“. The talk includes their work creating NSF workshops on Technology-Mediated Social Participation (www.tmsp.umd.edu), the paper Reader-to-Leader Framework: Motivating technology-mediated social participation (which appeared in the AIS Transactions on Human-Computer Interaction in March 2009), and recent work with the Encyclopedia of Life (www.eol.org), and NodeXL projects. Here is the abstract. 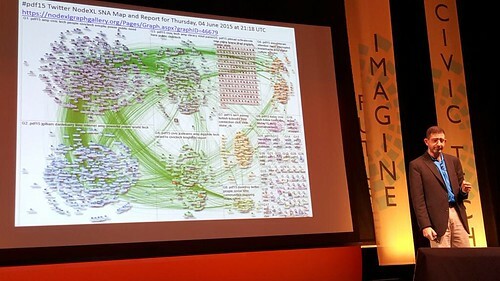 I spoke on June 4th at the Personal Democracy Forum in New York City about what social media network maps can tell us about various political figures and topics. The video is available here: http://streams.civicolive.com/stream/127/5040/6000. Political discussions are obviously a major area of social media use. This talk explores the ways social network analysis and visualization can be applied to mapping discussions of political issues and topics. 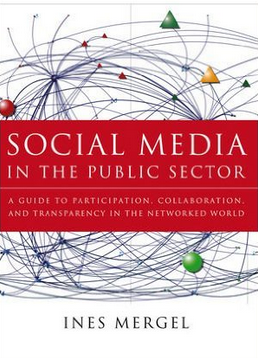 It features a number of NodeXL generated visualizations of twitter crowds and networks that form around topics like the conference hashtag #PDF2010 (and #PDF10) as well as political and current event relevant terms. View more presentations from Marc Smith. 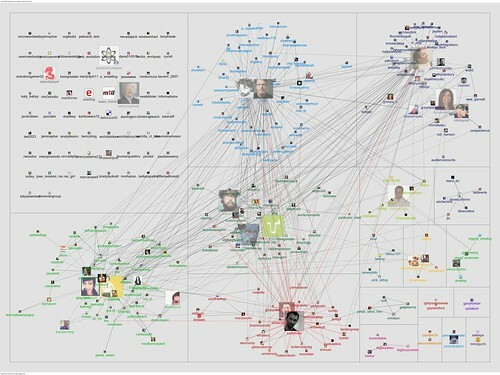 2010 – June – 3 – NodeXL – Twitter – PDF2010: This map represents the connections among people who tweeted the term “PDF2010”. It illustrates the people in the “center” and the sub-clusters in the map. People who occupy “bridge” locations are visible as well. 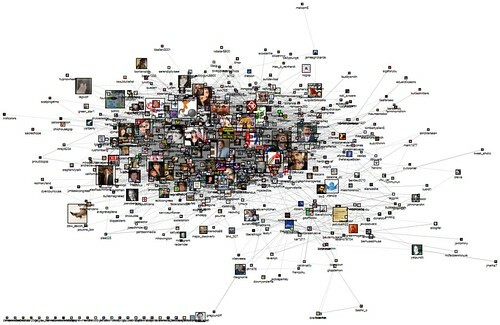 2010 – June 1 – NodeXL – Twitter – #tcot: This is a map of the “Top Conservatives on Twitter” tag. It has a large dominant cluster and a tiny sub group of tcot critics. 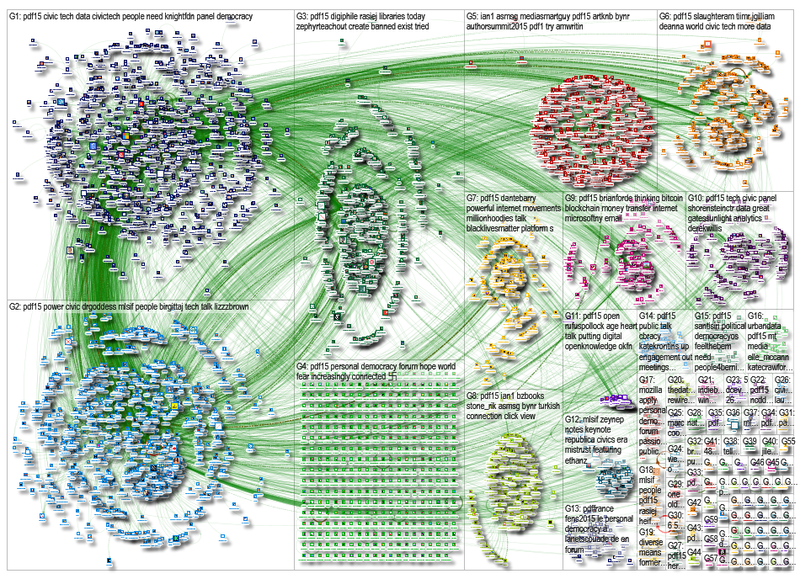 2010 – June 1 – NodeXL – Twitter – #p2: The #p2 hashtag is used by “Progressive 2.0” discussions. It features a clear dominant cluster of supporters and a smaller cluster of skeptics made up largely of conservatives. Outside the CUNY Graduate Center auditorium during PDF2010. 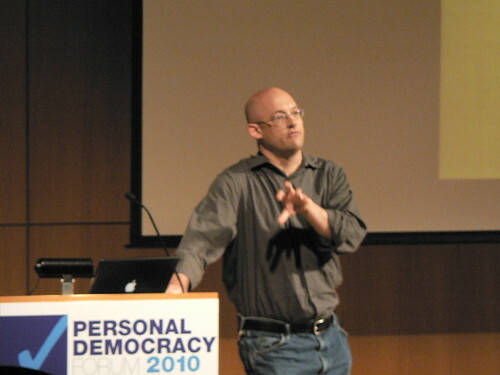 Clay Shirky’s talk was great: it wove together stories of collective action for good and trivial purposes that framed a call to increase the costs of political activity on the net rather than reduce as a way to improve the impact of contribution rather than their mere scale. 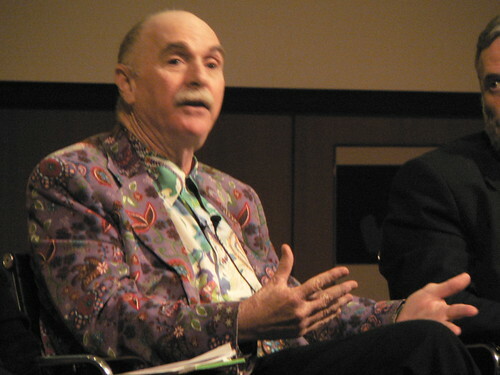 Howard Rheingold’s discussion with Micha Sifry was insightful, focusing on the ways the Internet can lull us into a lack of mindfullness. 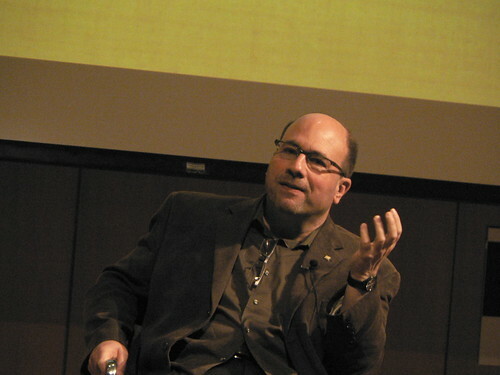 A Mindfull approach, Howard encourages, is one where we are not as easily pulled into random tangents and drift aimlessly from link to link and click to click.